What some Letter L things you can learn about at the library? Come up with a few on your own, and then sing this song. This is the way I learn about lions. Learn about lions, learn about lions. This is the way I learn about lizards. Learn about lizards, learn about lizards. This is the way I learn about lobsters. Learn about lobsters, learn about lobsters. This is the way I learn about ladybugs. Learn about ladybugs, learn about ladybugs. Visit the library and choose books with your child about good health and eating well. Ask the librarian to help you find a cookbook for children. 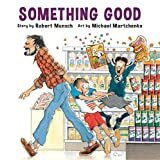 Children's Books that Encourage Healthy Eating - Check out these books from the library to get the conversation started in your family about healthy eating.